Just when you thought you've seen every rainbow creation out there, a sweet and savory rainbow grilled cheese appears. This recipe is inspired by the internet famous Kala Toast in Hong Kong. Brioche bread is buttered and stuffed with three different shredded cheeses including gruyere, mozzarella and swiss. 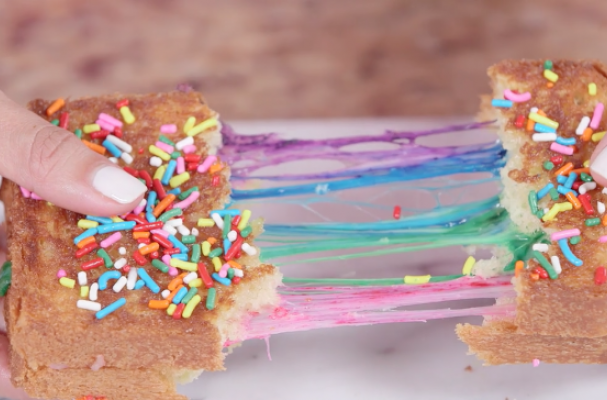 The key to getting the rainbow effect is to lightly toss the shredded cheese with food coloring. A little goes a long way so one drop of each color should be more than enough. If you want to go the extra mile, you can make your own natural food coloring by pureeing fruits and vegetables. For example, you can create a blend of arugula and basil for green, beet root and roasted red onion for red and taro for purple. The second method will add an underlying flavor to the sandwich. Rainbow grilled cheese is a fun food that the kids and adults alike will love.